You automatically double-knot everything you tie. You find yourself humming the Barney song as you do the dishes. 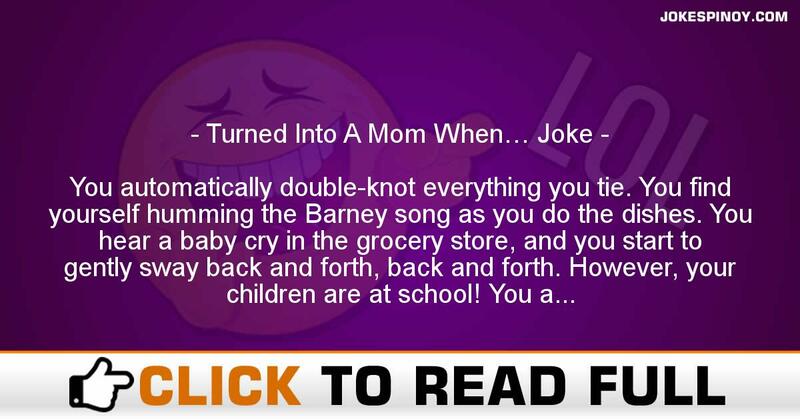 You hear a baby cry in the grocery store, and you start to gently sway back and forth, back and forth. However, your children are at school! You actually start to like the smell of strained carrots mixed with applesauce. You weep through the scene in Dumbo when his mom is taken away, not to mention what Bambi does to you. You get soooo into crafts you contemplate writing a book called 101 Fun Crafts to do with Dryer Lint and Eggshells. You spend a half hour searching for your sunglasses only to have your teenager say, “Mom, why don’t you wear the ones you pushed up on your head?” You are out for a nice romantic meal with your husband, enjoying some real adult conversation, when suddenly you realize that you’ve reached over and started to cut up his steak! ABOUT US : Laughter is the best medication as the old saying says, we at JokesPinoy.com will give you all the comical filipino quotations and photos in tagalog language. Back in 2013, a group of Filipino OFW (Overseas Filipino Worker) got bored and they make an effort to look for some funny quotes online just to have fun but sadly most of the websites they discovered on that time are having an obsolete jokes and have no interaction with the users. From that instant, they subsequently got an idea to build their own jokes website and let other users to give their jokes or comment together with the existing jokes. After the funds and concepts accumulated, JokesPinoy.com was born, a website that let the user share their jokes and let them have dialog with other users as well. Since the website has been launching, tens of thousands of visitors are coming each day to read jokes and have fun on the website and also as giving their opinion on the jokes they read. We expect from JokesPinoy.com this website may give you some smile and happiness, Life is Short so have fun on it. DISCLAIMER: Some of the jokes, photos and videos found in this site aren't created by us, they're made by our users or they just get it somewhere in the web only like 9gag, youtube, metacafe, vimio and etc. We regard copyright info that is posted here including funny pictures and funny videos. If encase there are files posted here in our site that is owned by your and you don't desire to share it to anybody afterward fell free to contact us to remove it. Majority of the language used on this site was in tagalog and some are bisaya that are both filipino language which originated from Philippines, should you would like to interpret the joke to english you can used an online translator to interpret it from tagalog to english.